Beta Testers: Aiden Baxter, Gesine Betker, Natalia Carmo, Natalia Carmo, Cecilia_Rosewood, Victor Chen, Eric Chin, Ian Crider, Ariana Fletcher, Thomas Freeman, David Frohman, Higor Goltara, Braylon Hecimovich, Oliver Horton, Christopher Kooyman, Kendra Larrabee, Andy Ling, Joel Martin, Jamie Midwood, Min Nay Htun, Cole Nixon, George Peery, Ed Phillips, Ramidel, Dean Sciglitano, Cheryl Tay, Eric Thomas, Harry Thundow, Michael Tucker, Thomas Vinci, Vu Hong Hanh. 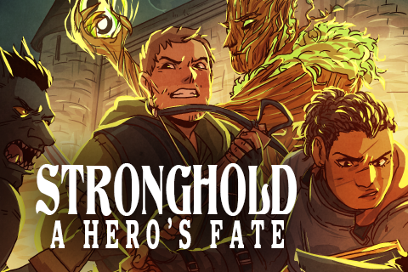 "Stronghold: A Hero's Fate" is Copyright 2018 Jo Graham & Amy Griswold. All rights reserved. Jo Graham worked in politics for fifteen years before leaving to write full time. She is the author of the Locus Award nominated Black Ships and the Spectrum Award nominated Stealing Fire, as well as eight books of the Stargate Atlantis: Legacy series. She is also the author of historical fantasies Hand of Isis, The General's Mistress, and The Emperor's Agent, as well as an additional Stargate Atlantis novel and an SG-1 novel. With Melissa Scott, she is the author of The Order of the Air series of historical fantasies set in the roaring twenties and the Great Depression. Her forthcoming novels include the historical fantasy/spy novel The Marshal's Lover and the fifth Order of the Air novel, Oath Bound. Jo Graham lives in North Carolina with her partner and their daughters. Amy Griswold is the author (with Melissa Scott) of Death by Silver (winner of the Lambda Literary Award) and A Death at the Dionysus Club, fantasy/mystery novels set in an alternate Victorian England. She has also written multiple Stargate tie-in novels for Fandemonium Books, including the Stargate Legacy series (with Melissa Scott and Jo Graham). She can be found online at @amygris. Their previous title with Choice of Games, The Eagle's Heir, is available for sale on iOS, Android, Steam, and the web.